I've known many people who wrestle with prayer. Some feel like it's just talking into the air or a waste of time since they don't hear an audible answer back or see immediate fruit from their prayers. Others feel like it's pointless because God is sovereign and will do what he wills to do however he wills and He need not be distracted or swayed by our puny voices. Honestly, I don't blame them or anyone else for these feelings. I've had them too. However, I've also had times of great refreshing through prayer where I definitely sensed God's Spirit speaking to me. Those times are not as often as I would like and there are many times I have pleaded with the Lord for things I truly believed were in His will that didn't come to pass (at least not how or when I desired them to). That is why I truly like C. S. Lewis's quote above. I pray not because of the answers I experience - I know He answers all prayers with either "yes", "no", or "Wait". (sometimes all of the above at different times in response to a particular prayer.) I may not see that answer or hear it audibly, but I still entrust it into His capable hands. I pray not because I think I am smarter than God and can inform him on when and how he should act on my behalf - I trust Him to always do what is right and good. Like Lewis, I pray because I recognize my absolute need for God in my life. Most of all I pray because it tunes my heart to beat in time with God's heart. Prayer reminds me to surrender, to trust, to believe that He is for me, not against me. Here are some other good reasons to pray. Pray because It is how we grow as believers. It always has been since the beginning of the church. We Talk to our Maker and Savior through prayer and we read/listen to His word in order to grow in our faith. These are the bare essentials. Without these spiritual disciplines I will stagnate in my faith and it will die a slow death. Pray because Jesus expects it. In Matthew 6:5-9, Jesus repeatedly says "when you pray". That's because he expects us to pray. As we have journeyed through John we have seen that prayer is a critical part of being connected to the mission and life of God. Jesus expects us to ask for things "in my name" and to believe that we will receive these things. Of course we have said again and again that praying "in his name" is no magical incantation that bends God's will to ours. Instead it is us praying according to his reputation, character, and power - believing he is able and willing to do the best thing. Jesus also says in Luke 11:9 that we should "Ask... Seek... Knock..." all of which are continuous actions, never ceasing, but always pursuing him knowing he is the good judge who will hear our case and act in his sovereign timing just as he did for the persistent widow in Luke 18. Pray because God’s Word Makes it Clear that we should. In Colossians 4:2, we are urged to be devoted to prayer. In 1 Thessalonians 5:16-18, we are told to pray continuously (rejoicing and thanking) that this is God's will for your life in Christ Jesus. As you pray, hold on to these reasons. Surrender your will to His. Trust the one who knows best. Acknowledge your dependence. Be obedient to his commands. Tune your heart to His and be changed. P.S. This article is not intended to be the final word on prayer. Many have written much better and much more than I have. Still, I hope it blesses you. Some of the content was adapted from Donald S. Whitney's Spiritual Disciplines for the Christian Life. NOW DON'T FORGET TO REGISTER! 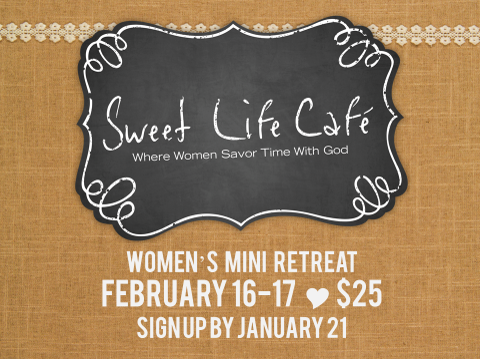 Register for these amazing spiritual growth opportunities soon! You really can't find such quality events for such a low price. Don't miss them! They'll be here before you know it! You can click on the images above for more information about these events.